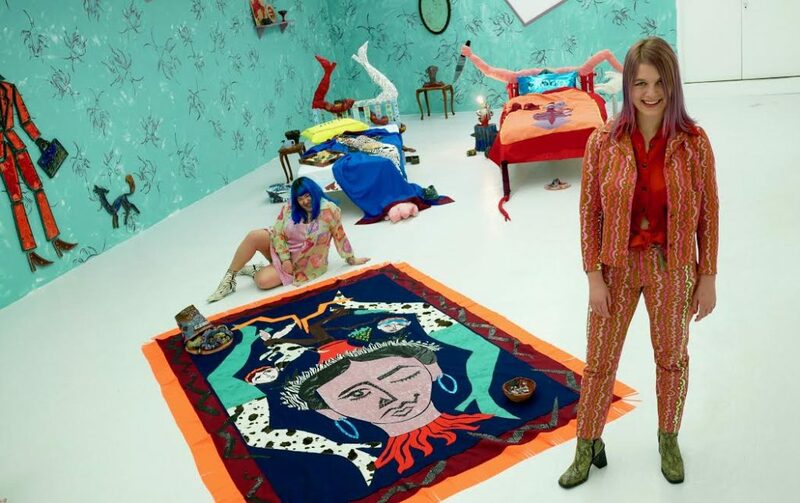 Artists Lindsey Mendick and Paloma Proudfoot at their collaborative exhibition PROUDICK, Hannah Barry Gallery, London, 2018. Photo: Michael Proudfoot. 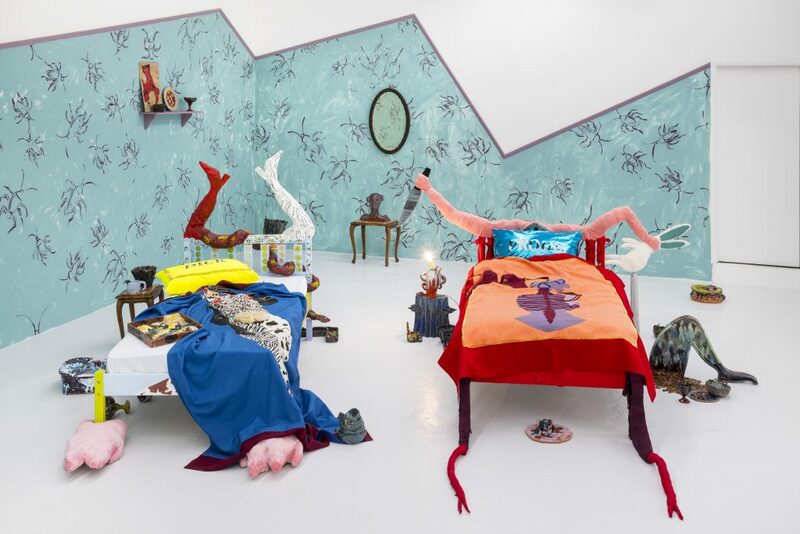 PROUDICK, the first collaborative exhibition by artists and best friends Lindsey Mendick and Paloma Proudfoot, opened on 7th November to a huge crowd at the Hannah Barry Gallery in London. 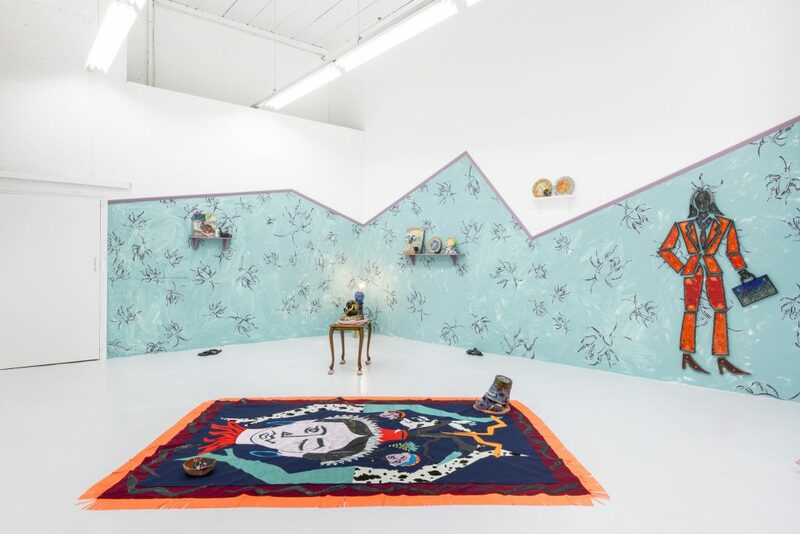 Ahead of the opening of this exhibition curated by Marcelle Joseph, Huma Kabakci had a conversation with the two artists about their show, feminism, Medusa and the evening of performances titled PROUDICKOCK! coming up on Wednesday, 21st November. HK: Both of you have been included in the same group shows in the past and you share a studio together, but PROUDICK is your first collaborative exhibition. I must say, I love the title of the exhibition drawing from the celebrity couple names, such as Brangelina, Bennifer and Kimye. Can you please explain further how this exhibition idea and concept developed, also with Marcelle Joseph curating the show? PP: Like you said, we’ve worked so closely together over the last few years, even while we were still studying at the Royal College we were sharing a studio. And then we also share the medium of ceramics. We give each other advice on everything, but we’ve never actually really collaborated to this extent. We’ve done some small collaborative pieces before, but nothing on the scale of an entire show. And I think originally we wanted to do the exhibition in a chapel that we knew that Marcelle had curated a show in before. And so we approached her to see whether it would be possible for us to do a show with her there. 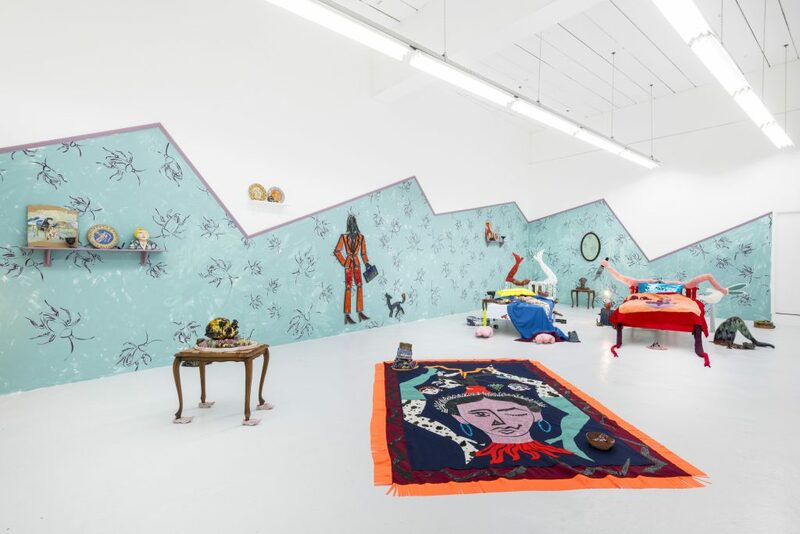 Installation shot of PROUDICK, Lindsey Mendick and Paloma Proudfoot, Hannah Barry Gallery, London, 2018. Photo: Damian Griffiths. HK: Oh okay, so you approached her first. PP: Yeah. And then, I can’t remember why, but we weren’t able to use that space, but Marcelle was really keen to work on that show with us together and we thought it would be really nice to have her help with the curation and give the show a framework. LM: It was this sort of thing of actually having some sort of curatorial construct for what we were doing, rather than just working. Just us two was a bit frightening I’d say. PP: Then Marcelle got in touch with Hannah Barry. I didn’t really think that Hannah Barry would come through and then it did. So it was a nice sort of serendipity that we started out with quite a different idea for the show – that we wanted to make a show about the Medusa and then with the space changing, and as we talked about other things, it inevitably became this other less straightforward beast. Even though we share ceramics as a medium, our work is ostensibly quite different and we were surprised to find that actually we had more in common in terms of influences than we expected. We were chatting about our first influences when we were teenagers and how for both of us Tracey Emin and Sarah Lucas had been massive influences. And how even now we think that they’re amazing artists even though Tracey Emin has been critically disparaged a bit and has questionable politics – we still massively respect them both as artists and people who play with the absurdity of being in the public eye. LM: Yeah. But also as well you’re meant to be this right level of feminist, not this wrong level of feminist, and it just feels like at the moment it’s really complex how to be female or how to feel like you’re succeeding at being female. And I think one of the things that happens quite a lot to both of us is that there’s something very disingenuous about social media and Instagram and things like that. Paloma and I disagree on quite a lot of things. But the one thing that we just really inherently need each other for is to hold each other up in this sort of climate that we work in. It’s hard. There’s a lot of self-doubt. For me, it’s always wonderful that I can turn around to you and laugh at these things that terrify me about myself. And then you can laugh back with me. And the whole show seems to be about us empathising with each other. HK: So that dialogue between friends. LM: And I think that that’s one of the things that I’m finding quite difficult at the moment… to exist in the current realm where you’re meant to be so strong and so like, “I’m a strong woman.” And people will take a photo and want you to do a Superwoman pose but then also at the same time you are so fragile in some respects. And it’s not wanting to admit that that I’ve been trying to explore this fragility in my work for a while. HK: I mean there’s this pun in it, PROUDICK, but also the undertone. There are so many references within. Both mythological, but then you’ve talked about Tracey Emin, Sarah Lucas and the role of being female. LM: But I think that was one of the things as well with Tracey Emin and Sarah Lucas. It’s like Sarah Lucas is quiet, well, quieter, isn’t she? In the way that she does her work. And then Tracey Emin is so loud and then it’s just the crux of their friendship of when they were on the same page with The Shop on Brick Lane and that’s what Pom and I had been trying to take our inspiration from – the idea of commodifying your failure in some sort of respects or commodifying your pain. And we’ve missed each other from working apart so much this year. I think it is probably a celebration of friendship… I can’t tell whether it’s more telling of female friendship or friendship in general but I think definitely female friendship. HK: Yeah, I was gonna say, the female… Is kind of present. PP: Yeah. I go really slow and quiet. LM: But there’s a lot of waiting in the process as well. There’s a lot of immediacy and then waiting and then immediacy. We’ve been doing quite a few fabric pieces together for this show. HK: Okay, that was going be my next question. 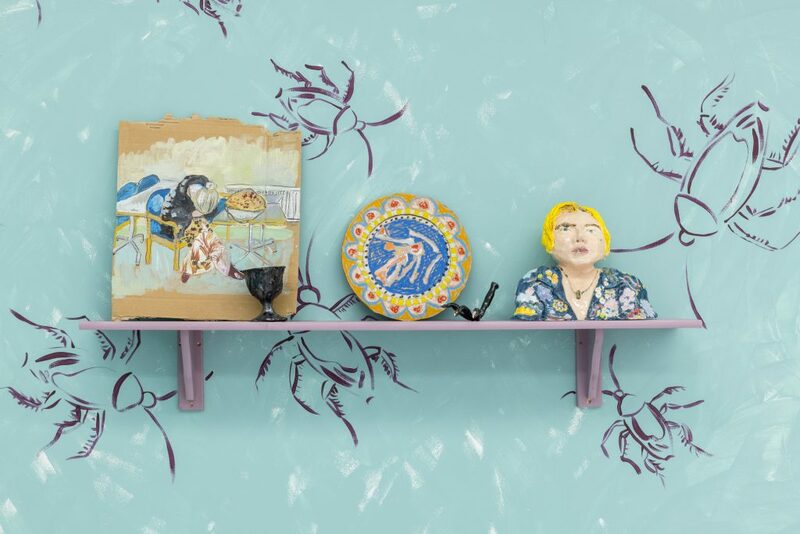 Have you produced works in any other medium other than clay for the exhibition? LM: It’s this really weird thing… We both talk quite a bit about the loneliness of making. And then we had just this small room in my kitchen and we were making all of these fabric pieces. And my mum came along as well but we’d been going on for a couple of days and another of our friends came over and we were just talking and having cups of tea, and it was just so lovely and just a completely different environment to be in. Just four women sitting around and chatting. It was a really beautiful time. But then it’s really odd because whenever I do any sort of sewing pieces I have to have my mum help me because I’ve got no tolerance for it. And then my mum saw me making stuff. Afterwards she was like, “Oh, you’re cutting things out properly.” And I think it’s things like this that Pom made me do… I think it is really good when Pom teaches me stuff like that. And I imagined that when we were doing these fabric pieces that Pom would take more of the lead, but then she was really great in helping me with designing stuff and it kind of felt really natural that we were doing it together. LM: Oh my god, it’s the most satisfying piece I’ve ever done. HK: Can you both explain the mythological references and how it inspired you both for this exhibition as it was your starting point? LM: We started talking about mythology from the beginning stages of preparing for this exhibition. It just became a symbolic language that we started using. The whole show came from me and Paloma both being in Harlow as we were both up for the same award. And that’s what is so odd about our friendship. We are always out for the same things, the same people talk to us and there is an element of… we all have to be competitive against each other. We are both artists… Graduating at the same time… We have similar career goals. PP: We share so much fiction as well because we listen to audio tapes in the studio. The show is based around this amazing quote from an essay written by Anne Carson about female pollution in antiquity: ‘For a man wins no better prize than a good woman, and none more chilling than a bad one– always hunting something to devour. And no matter how strong he is, she roasts her man without fire, and hands him over to a raw old age’. HK: So for the 21st of November, there will be an evening of performances titled PROUDICKOCK! PP: Alarming sending her our messages because we have such a weird sort of rapport… it’s like mixing really personal stuff in the weirdest stream of consciousness where nothing relates to each other and makes no sense to the outsider listening in. LM: I thinks it’s because we know exactly what’s happening in each other’s life. LM: Staging an eating contest. PP: We’re doing an eating contest. HK: Yes, I read about that. Yeah, I was kind of intrigued by the whole thing… So you’re inviting members of the public to also take part in it as well? How does it work? Lindsey: Yeah, not just us. LM: Yeah, exactly. It’s like a paradox between the two and where’s the reality. And so we were like, “Why can’t we create this environment where these women can be messy and we’re gonna create this sort of place where messiness is wanted and… Yeah, it should be good. HK: Great, I’m excited. I’ll be there! PROUDICKOCK! will be an evening of performances exploring so-called ‘acceptable’ feminine behaviour and the millennial anxiety of both meeting and ignoring these expectations. Proudick, the celebrity couple portmanteau the artists Lindsey Mendick and Paloma Proudfoot have branded themselves for the duration of the collaborative exhibition in the gallery, will stage an eating contest, a messy protest to the line of exes who have made fun of their shared enthusiasm for food. Through loud mouthfuls of hotdog, Proudick will out their ordinarily private misdemeanours. Teddy May de Kock will create a soap-opera-style performance created from the stream of text messages that Proudick have sent each other. 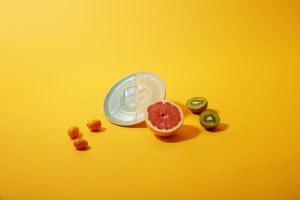 Mendick will be harking back to teenage lovelorn misery in a musical exploration of Leona Lewis’ seminal Bleeding Love, and Proudfoot will perform a new text work based on Hannah Wilke’s 1982 song Stand Up. The evening of performances will start at 7 pm on Wednesday the 21st of November 2019 but the gallery will be open from 6.30pm to view the exhibition. The exhibition continues until 12th of January 2019. This entry was posted in NEWS and tagged Lindsey Mendick, Paloma Proudfoot. Bookmark the permalink.